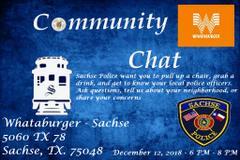 ***REMINDER***The Sachse Police Department wants to invite you to the third Community Chat event. The police department continues to look for new ways to build on the relationship we have with our community. By creating an informal setting for which you can get to know your police officers, we can continue to develop community relationships. The event will be held on 12/12/2018 from 6:00 PM until 8:00 PM at Whataburger in Sachse. We hope to see you there!